This holiday house is in the mountain village of Bocado 7kms from Arganil. Renovated in 2011 it is built with local stone, xisto, and has spectacular views down the valley and out to the mountains. Most of the rooms have retained some of the natural stone walls with a high vaulted wood ceiling in the living room and the main bedroom. Free Wi-fi internet access is available. There are 3 double bedrooms, 2 have a double bed and the third has 2 single beds. The living room has a sofa bed for a 7th person for an extra €25 and a wood burner for the winter months, there is also a TV with Portuguese sattelite(some English programmes), games and books. The kitchen is well equipped for a self catering holiday with a dining table and seating for 6 people. Outside there is a private garden with garden furniture for outside dining, 4 sun recliners and a barbecue. The views from the house are fantastic and the sunsets are spectacular! Price is for 6 people with a discount for less depending on the season. Things to do: Most visitors to the Arganil area come for the peace and quiet and the relaxing atmosphere. You can stay by the house taking in the wonderful views whilst topping up your tan or discover some of the lovely river beaches along the Rio Alva where you can swim or just laze to your hearts content. An information booklet is in the house with more details. Canoes and pedaloes are for hire at some of these river beaches. The nearest river beach is at Folques 3kms from the house with a picnic area and parking. If you want to go further afield there are more things to explore. The ancient Roman town of Conimbriga is approx. 1hrs drive. These are some of the best preserved Roman ruins in Portugal and there is a very interesting museum with artefacts found on site and in the surrounding area. If you want a day at the seaside then the popular resorts of Figueira de Foz and Mira with golden beaches are only 1 hr drive from Bocado. Figuiera is a large town with everything for the family, Mira is smaller but still has fish restaurants and shops as well as a small lagoon. Both Arganil and Coja have a selection of restaurants serving both local and more international dishes. Most menus will have a selection of chicken, pork and fish dishes which can be washed down with the local Dao wines. The Portuguese wines are very good and of course the heavier Vinho de Porto or Port wine is a great way to finish a meal. Try the chilled white Port as an aperitif. If you are barbecuing you could try the Vinho Verde as an accompaniment this slightly sparkling wine is very refreshing served well chilled! There are some wine producers in the area that will give a short tour of their caves and provide a wine tasting, you may need to book. The Quinta de Cabriz is one of these and there is also an excellent restaurant on site. For those of you who have stayed at Casa de Xisto and those who are thinking of staying there I would like to let you know that after the terrible fires in our area the house remains undamaged! The land below the garden was burnt down to the bottom of the valley but we are already seeing seedlings poking their heads through the ashes and we are beginning our replanting project with fruit trees, vines and olives. Please do not give up on the house as more than ever we need people to come and visit the area and bring with them some trade to the area. The calendar has been blocked untill the beginning of December but for anyone interested in staying please get in touch. I moved to Portugal in 2013 after falling in love with the country during a holiday here. The area around Arganil reminds me of parts of Yorkshire or Scotland but with sun shine! I have bought several old houses and renovated them to make comfortable holiday accomodation just like the kind of place I would want to spend my own holidays in. I learnt Portuguese in the first year and now speak fluently. This house in Bocado is in my own village and has the same spectacular views that I first fell in love with. It is situated on a hillside above an ancient monastery with fantastic views down the valley. Whilst being in a quiet and relaxing position in the area it is also close to all the amenities, Arganil 7km, Coja 7km, Folques river beach 3kms. The house is built with traditional schist stone and I have kept as many of the internal walls as possible in natural stone which keeps the house cool in summer. There are oil filled electric radiators in the bedrooms during the ooler winter months. No beach towels are provided please bring your own. House towels should not be removed from the house. You can pick up the connection for wi fi internet with a password that is provided in the information folder in the living room. The woodburner is for use during the cooler winter months. logs are provided and included in the price. Some pantry items are in the cupboard. The high chair is the type that clips on to the table and is available by request. It is Portuguese satellite TV with some foreign channels. Casa muito acolhedora e tipica, muito bem equipada e decorada! Muito bom sitio para descansar, excelentes condições recomendo a todos! Very pleased that the house was comfortable and spacious enough for your extended family and that you enjoyed the beautiful countryside and the peace and quiet! We had a wonderful stay in this beautifully maintained, very clean property in Bocado near Arganil. The view from the backyard was spectacular. The house suited our family just great. There were many fun things to do nearby such as swim in the river, eat at good restaurants, and visit the beautiful Bucaco reserve. Jane was very helpful and welcoming. The place is at least as nice as all the pictures. The beds are very firm and the TV is pretty small, however, these things were minor compared to the beauty and peacefulness of the place. Highly recommended! Uma casa extraordinária, muito acolhedora, faz-nos sentir que estamos em casa, está completamente preparada para ficar lá durante uma semana. É um pequeno refúgio de paz para fugir ao stress do dia a dia de cidade. Muito bom mesmo, e a jane ( proprietária da casa) está sempre disponível. Bocado is a small mountain village located in the Serra de Acors and has superb views over the ancient monastery of Folques and down the valley. The village is approx. 7 km from the district town of Arganil where there are lots of restaurants, shops and a public swimming pool and approx. 7 km from the Roman market town of Coja with its pretty river beach and cobbled streets.The nearest river beach is at Folques 3 kms from the house. The local countryside is very beautiful with pine forests and small villages dotted along the mountainsides. The Rio Alva runs through the village of Coja and on through the town of Arganil and there are lots of river beaches to discover along its banks. Coimbra is an ancient university city approx. 45kms away that was once the capital of Portugal, it is woth a visit to wander through the narrow cobbled streets and take in the amazing view from the university over the Rio Mondego. The Serra de Estrela is approx. 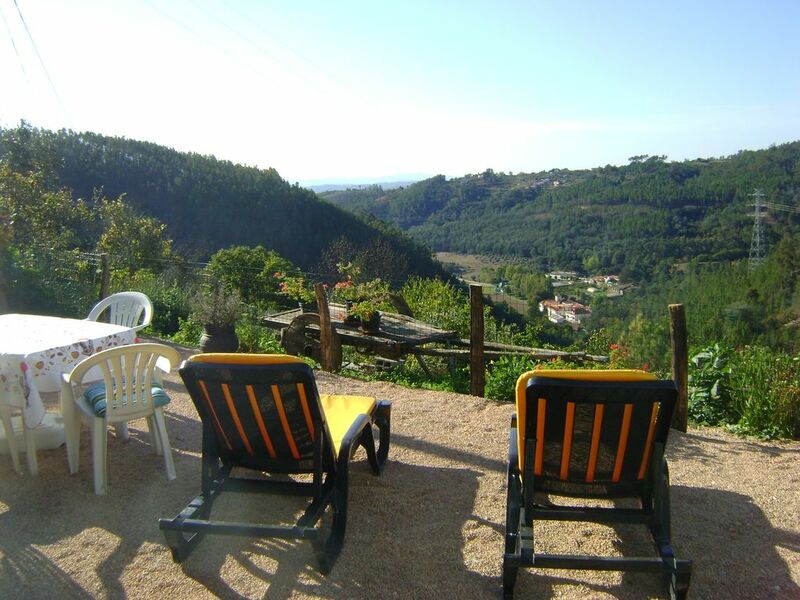 45kms drive and is the highest mountain range in Portugal, there is skiing here in the winter. Golf: There is a good golf course open to the general public in the grounds of the Monte Bello Hotel in Viseu approx. 50 km from Arganil. Ski: There are ski slopes on the Serra de Estrela that are open through the winter months. Minimum rate for 1 night for 2 people is €50 A discount is available for less than 6 people depending on the season. There is an extra charge of €25 for a 7th person to cover the extra bed linen and towels.